So you have a critical load and you need to ensure no downtime. Of course you need an uninterruptible power supply (UPS) – but what configuration should you choose? In fact, what are the options available to you? The reliability of a UPS installation is largely dependent on its configuration. To achieve 100% reliability of a UPS installation it would be necessary to ensure that there are no single points of failure. This would entail duplicating not only the UPS systems but all reticulation and the load itself. The above solution, although desirable, is relatively expensive to achieve and not many institutions are willing to pay the price. The most common type of UPS installation is a single standalone unit, fitted with a static bypass switch which transfers the load to raw mains in the event of an inverter failure, as suggested in Figure 1. Such a configuration does however have drawbacks, in that to carry out routine maintenance effectively; the load will have to be fed by mains. Thus the load is put at risk every time maintenance is done on the UPS. Generally most users cannot afford any downtime and these results in costly maintenance being done after hours or ‘taking a chance’ that mains will not fail. Furthermore should the UPS develop a problem the load is subjected to mains power for the period it takes to repair the UPS. Should a failure occur on the master unit, the slave unit will supply the full load, via the master unit’s static bypass switch. Higher losses, lower efficiencies, and worse regulation of the output. The cost is less than that of a parallel redundant configuration. In this configuration the load rating is made up of an ‘n’ UPS unit, each supplying 1n of the load rating. One additional unit, also of rating 1n th of the load is added for redundancy. For example, a 300 kVA load would be supplied by four, 100 kVA units, giving a redundancy of one unit. The units all run in a parallel configuration and are of equal power rating, sharing the total load draw in equal proportion. In the event of a failure on one of the units, the faulty unit will be shut down and the full load will automatically be assumed by the remaining units. There will be no voltage fluctuation, frequency fluctuation or short breaks in the output voltage whatsoever. A two block system can be equipped with one set of batteries, which will reduce the system cost and enable cross feeding, i.e. one rectifier can feed two inverters. Further improvement of reliability is obtained by adding a second set of batteries. In addition the battery can be configured as parallel strings, further increasing redundancy. While the parallel redundant configuration clearly applies to critical loads, the user must be cognisant of the fact that initially such a system is more expensive than a hot standby configuration due to the complex control required. A parallel system with a common battery allows for cross feed capability i.e. 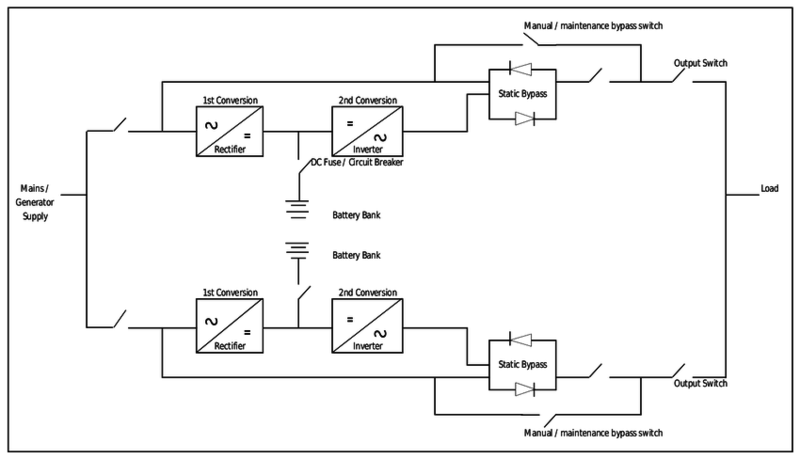 one rectifier can supply two inverters. As a user requiring a UPS, you need to be aware of the various UPS system configurations available to you. While each has its own strengths and weaknesses that need to be considered, a parallel system will supply increased reliability and ensure an uninterrupted supply to the load, even during maintenance.